Automatic platform gates were installed on the Blue Line platform in 2006 due to increased passenger congestion. Zhongxiao Fuxing (Chinese: 忠孝復興; pinyin: Zhōngxiào Fùxīng) is a metro station in Taipei, Taiwan served by Taipei Metro. It is one of the busiest, with a 35.768 million entries and exits in 2017. The station has both underground and elevated sections: two levels are underground (servicing Blue Line) and four levels above ground (servicing Brown Line). The station has two side platforms, one island platform, and five exits. Brown Line platforms are equipped with platform screen doors and Blue Line platforms are equipped with automatic platform gates. Washrooms are located inside and outside the paid area of the station. The station is situated at the intersection of Zhongxiao East Road and Fuxing South Road. The station features four long escalators directly connecting the B3 concourse level with the third-floor platforms. These escalators handle 96,000 transferring passengers daily. On 31 March 2017, Taipei Metro Corporation announced that escalator speeds would be increased from 0.5 m/s (1.6 ft/s) to 0.65 m/s (2.1 ft/s), increasing carrying capacity by 30%. The station can be very crowded during rush hour due to its status as a major transfer station between two lines. Exit 2 is integrated with the Pacific SOGO Department Store (Fuxing Branch) as part of a joint development project. It is the first business-oriented building based on a Taipei Metro joint development project. In 2010, the station was awarded a "Superior" award at the 8th Golden Thumb Awards (sponsored by the Executive Yuan) for the joint development project. 28 March 1996: Opened for service along with the opening of Brown Line. 24 December 1999: Became a major transfer station with the opening of the segment from Taipei City Hall to Longshan Temple of Blue Line. 10 November 2004: The connection between exit 4 and Pacific SOGO Department Store Zhongxiao Branch opened. 19 June 2006: The main connecting escalators gave off thick smoke, resulting in many trains bypassing the station. 1 December 2006: Automatic platform gates were installed on Blue Line, as first batch of installation among Taipei Main Station. Exit 1: Intersection of Zhongxiao E. Rd. Sec. 3 and Andong St.
Wikimedia Commons has media related to Zhongxiao Fuxing Station. ^ "Chronicles". Taipei Metro. 5 December 2013. Retrieved 10 October 2018. ^ "臺北市交通統計查詢系統". dotstat.taipei.gov.tw (in Chinese). Retrieved 15 September 2018. ^ "Route Map: Zhongxiao Fuxing". Archived from the original on 7 August 2010. ^ a b "臺北捷運忠孝復興站高揚程電扶梯 4月1日起試辦速度微調". Taipei Metro Corporation. 2017-03-31. Retrieved 2017-04-01. ^ "First working day sees overcrowding on Taiwan MRT Neihu Line". Taiwan News. 2009-07-06. Retrieved 2010-07-03. ^ "Pacific Sogo opens 11-story Fuxing outlet". Taipei Times. 2006-12-30. Retrieved 2010-06-16. 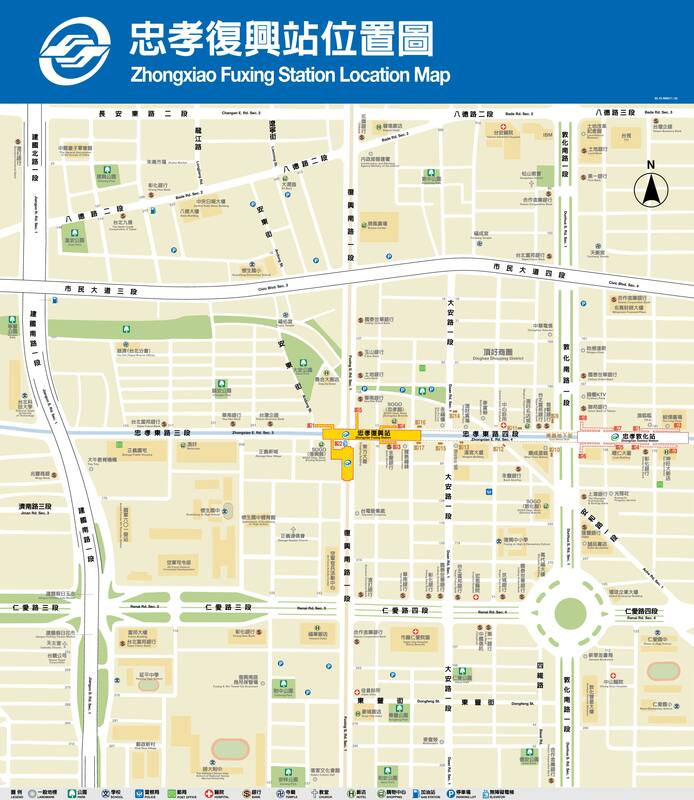 ^ "Zhongxiao Fuxing Station Location Map". Department of Rapid Transit Systems. Archived from the original on 6 March 2012. Retrieved 2010-06-16. ^ "工程線上 Status Report: 忠孝復興站聯合開發大樓委託投資經營". Department of Rapid Transit Systems. 2007-03-01. Retrieved 2010-06-19. ^ "Zhongxiao Fuxing Station JD Project Wins 2010 Golden Thumb Award". Department of Rapid Transit Systems. 2010-11-22. Retrieved 2010-12-01. This page was last edited on 5 April 2019, at 23:55 (UTC).